As I mentioned in yesterday's post, the participants in the eclectic musical ensemble are all acquaintances of one guy, who thought it'd be nice to get them together. Some of them belong to a camera club together, so advanced amateur photographers were plentiful in attendance, both on stage and in the audience. The central acquaintance, Nishimoto-san, had a Canon 85mm f/1.2, a beautiful, robust lens, that we all ogled. 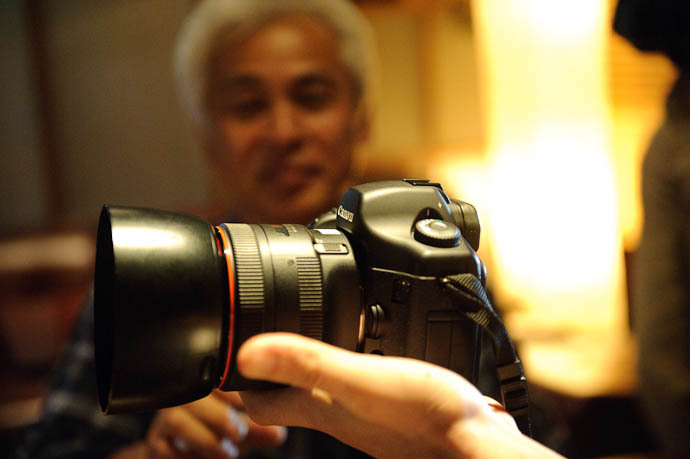 Nikon has nothing comparable, though there is a Nikon 50mm f/1.2. Zak used to have one, which I've borrowed to good effect to get artsy-fartsy with the shallow depth of field, and with my D700 to explore the depths of low-light photography. It was during the pre-concert setup that Stéphane was playing with my D700 and 85mm f/1.4 that Zak noticed the interesting photo opportunity of Nakamura-san with his Ricoh compact while in full traditional dress, holding his priceless shou instrument, so he quickly borrowed the camera to snap the shot that leads this post. 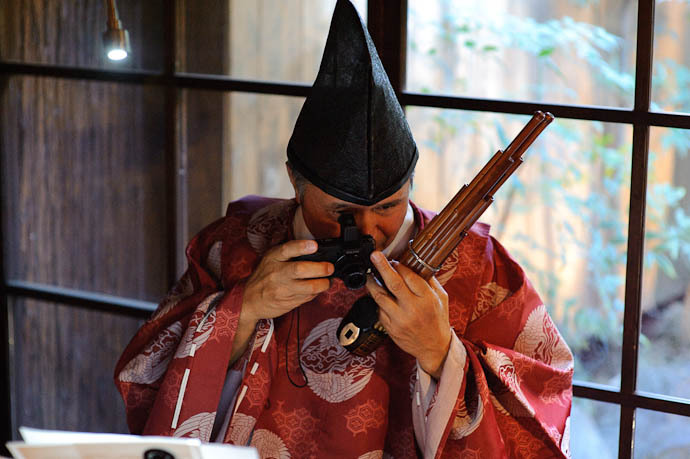 The shot you included by Zak of the gentleman in the traditional clothing with the priceless shou instrument and the Ricoh camera is very interesting. -> The way he is juggling the camera and the instrument speak to something about maybe balancing the old with the new. And yet all of is so quintesentially Japanese. 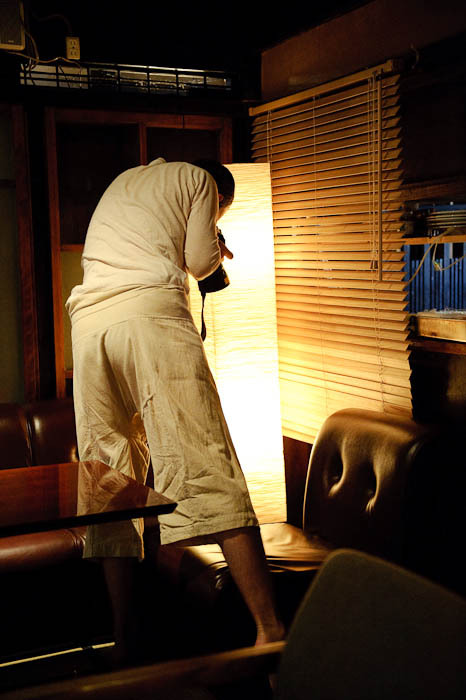 (Kyoto, the arts, the camera, the Shou, the outfit, etc.) 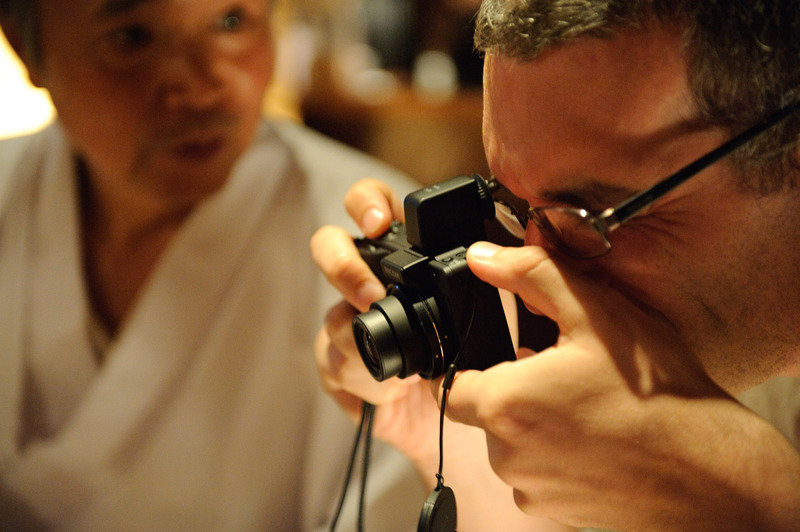 I’m curious as to what the benefits of the Ricoh (is that a GX200?) camera were/are? Those low light shots are very warm in their color. Do you have to do a lot of post-shot work for these ? E-gads! The 50/1.2 is gone! For shame. I fence-sat on my mediocre 50/1.4 AIS until I saw your shots; sold the old 1.4 and got the 1.2 instead. 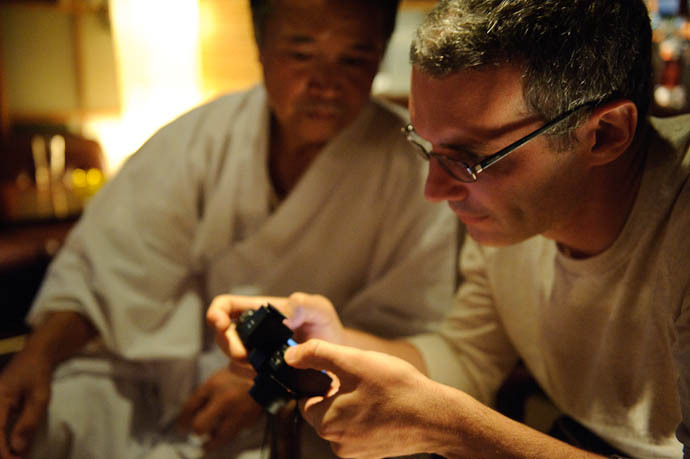 I think that Ricoh camera is a GX200.